Bassist/vocalist/composer, Jeff Denson has balanced a full career as both an acclaimed performing musician and a highly respected educator. Jeff has toured extensively throughout the U.S. and Europe with both his own groups - including the renowned cooperative trio Minsarah - and has worked with some of jazz's finest artists, such as Brian Blade, Anthony Davis, Joe Lovano, Jane Ira Bloom, Kenny Werner, Charles McPherson, Dave Douglas, Ralph Alessi, Cuong Vu, Walter Smith III, Dayna Stephens, Lionel Loueke, Kendrick Scott, Vadim Neselovskyi, Leo Genovese, Warren Wolf and an ongoing relationship with the legendary alto saxophonist, Lee Konitz since 2007. Jeff has the unique distinction of being the bassist in the Lee Konitz New Quartet, a group that Kontiz says is his only "actual band" in his 60+ year career. Jeff has released over a dozen albums as leader or co-leader as of 2017, and is currently working on his next projects. To date, he has released five albums under his own name, including Secret World on Between the Lines Records, a quartet featuring Ralph Alessi, Florian Weber and Dan Weiss, a pair of duo recordings on pfMENTUM Records: Two, with the remarkable Swiss clarinetist Claudio Puntin; and I'll Fly Away, a re-imagination of hymns and spirituals with pianist Joshua White, Jeff Denson Trio + Lee Konitz on Ridgeway Records featuring the legendary Konitz, Dan Zemelman and Jon Arkin and Concentric Circles also on Ridgeway Records featuring Dan Zemelman, Alan Hall and the world's premiere jazz bassoonist, Paul Hanson (formerly with Bela Fleck and the Flecktones). With a doctorate from the University of California San Diego, Jeff is a full professor at the California Jazz Conservatory, as well as the Artistic Director of Ridgeway Arts, Inc. a 501(c)(3) non-profit arts organization dedicated to developing cultural and educational imperatives. ""Master of the jazz bass." 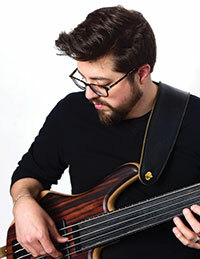 "Double bassist Jeff Denson capitalizes on his considerable gifts as an improviser, interpreter and sonic trailblazer..."
"Denson is breaking new musical ground, proving that he should be counted as one of the leading bassists of contemporary jazz." San Francisco String Trio "May I Introduce to You", Ridgeway Records TBR "Lee Konitz/Florian Weber/Jeff Denson/Adam Cruz Live at Birdland"
"The Bill Peterson Trio", Bill Peterson Trio, BPMusic. "Let’s Close Our Eyes", Breathing Three. "Reverie", Inga Swearingen with The Bill Peterson Trio. "Florida State University Jazz Ensemble featuring Carl Allen". "The Nicholas Simmion Quintet", featuring Lee Konitz. "Detmold Musik Hochschule Gospel Choir", Detmold Musik Hochschule Gospel Choir. "Transfers", The Bryan Leitch Trio. "Notes on the Bridge", Mariah Picot and the Bill Peterson Trio, Blue Music. "Early Summer Sketch", Bjorn Wennas Quartet, Beartones. "Music for Six", Ben Adams Sextet, Brindley Music. "U Street Sounds", Sound track for the award winning, PBS aired, documentary directed by Greg Smalfelt and score composed by Brian Keegan, (Communicator Award for Best Music).